Hanoi (VNA) – The Ministry of Public Security on September 16 issued an arrest warrant domestically and internationally for Trinh Xuan Thanh, 50, former Chairman of PetroVietnam Construction Corporation (PVC). 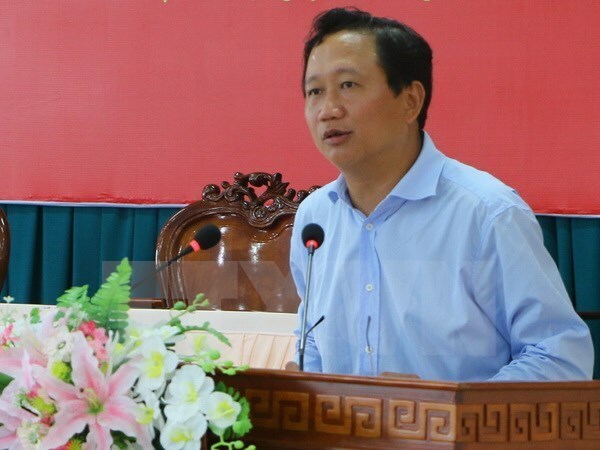 The ministry decided to prosecute Thanh, a former member of the Party Committee of the Mekong Delta province of Hau Giang, for alleged violations of State regulations on economic management resulting in massive losses for the PVC during his leadership. The ministry ordered his detention and a search on his house. Earlier this month, members of the Secretariat of the Party Central Committee agreed to expel Thanh from the Party with the motion winning 100 percent of votes. According to the Secretariat, between 2007-2013, in his positions as Deputy Secretary of the Party Committee and Director General of PetroVietnam Construction Corporation (PVC), and later as Secretary of the corporation’ Party Committee and Chairman of the Board of Managers, Thanh showed irresponsibility and negligence in the leadership and management of the corporation’s operation, and violated legal regulations on business administration, resulting in many wrongdoings and losses of nearly 3.3 trillion VND (142 million USD). As the top official of the corporation, Thanh must bear the main responsibility for the mistakes and wrongdoings, but he was not serious and honest in acknowledging them. After being transferred to Hau Giang province, while serving as a member of the provincial Party Committee and Vice Chairman of the provincial People’s Committee, Thanh used an official plate on his private-owned luxury Lexus car, which was illegal. The Secretariat also noted that as Thanh was responsible for the wrongdoings, law violations and losses at the PVC, leaders of the Vietnam National Oil and Gas Group assessed that he had not fulfilled his duty and removed him from the position of Secretary of the Party Committee and Chairman of the Board of Management of the PVC. This meant he was not eligible for any promotion or transfer, but Thanh himself proposed for his transfer and let relevant agencies conduct procedures to appoint him to leading positions at the Ministry of Industry and Trade and Hau Giang province, which showed his dishonesty and irresponsibility. Furthermore, he was dishonest and unrepentant during the self-criticism process, the Secretariat. Earlier on September 15, the ministry of Public Security announced a decision to prosecute former PVC executive officials for violations of economic rules at the corporation. They include former Director General and former member of its Board of Directors Vu Duc Thuan, Deputy Director General Nguyen Manh Tien, former Deputy Director General Truong Quoc Dung and former Chief Accountant Pham Tien Dat.